Tatar Guards – Still a Good Investment? We have long recommended on this website that people protect their original analog meters. Doing so has always seemed so much better a choice than trying to get rid of a smart meter once one has been installed. Getting rid of a smart meter is much harder than protecting your original analog meter. If you need to get a smart meter removed we recommend you contact us through michiganstopsmartmeters.com or contact smartmetereducationnetwork at gmail dot com. At first we recommended putting a padlock through the loop and posting a sign of refusal next to the meter. That worked for quite a while. 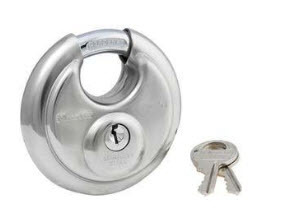 Then we heard reports that installers were cutting off the padlocks or cutting through the loops. So, for more than a year now, we have been advocating meter guarding devices and specifically one type that is made and sold by John Tatar, which we have dubbed the ‘Tatar guard’. We understand that over 500 of these devices have been installed. Many homeowners have enjoyed the benefit of keeping off a smart meter, or at least delaying an installation for a year now. These guards bought time for folks and have, moreover, given many the courage to stand their ground against DTE bullies. 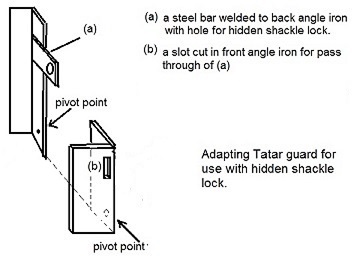 We have recommended that the Tatar guard be secured with a short shackle type of lock pictured at left below, rather than a standard padlock. But DTE has changed its tactics. They are now sending out installers with instructions to defeat Tatar guards where possible. Of the 500+ guards installed, we have heard reports that at least 5 and possibly as many as 10 of them have been defeated – either by cutting the shackle of the lock (above left) with a grinder or by prying the device away from the house. There are reasons to think that the unprotected short shackle lock and the manner of attachment to the house constitute the weakest links. The above shackle can be protected by surrounding the exposed portion of it with steel nuts or washers, so that there is no space for an installer to use a bolt cutter. Another solution would be to use a hidden shackle lock such as pictured at right. It is also likely that DTE’s new tactics will escalate because the utility will be emboldened by the February 19th ruling of the Michigan Court of Appeals. We will be putting up an analysis of that decision within the next day or two. That ruling (which can still be appealed) upheld MPSC’s approval of DTE’s so called “opt-out” plan, though it did not dispose of all issues related to the legality of DTE’s “opt-out” meter nor state that DTE had a right to force smart meter installations. Some of those issues still remain for us to challenge in the circuit courts. We have asked John Tatar to consider improving his product going forward and to also consider retrofitting existing installations for a reasonable cost based charge. Specifically we have urged him to (1) add a heavy gauge steel mounting plate that would slide behind the meter housing and to secure the guard to that mounting plate, and (2) to insure that each guard is installed with either a hidden shackle lock or a protected short shackle lock. Some of the existing installations may require retrofitting to accommodate either of these solutions. We doubt that any guard that could be made, sold and installed for a price most can afford is going to provide absolute protection against a determined installer. The whole point is to make it hard enough for an installer that he will walk away. Or make it so that the installer cannot remove the guard without damaging the meter housing or the house. 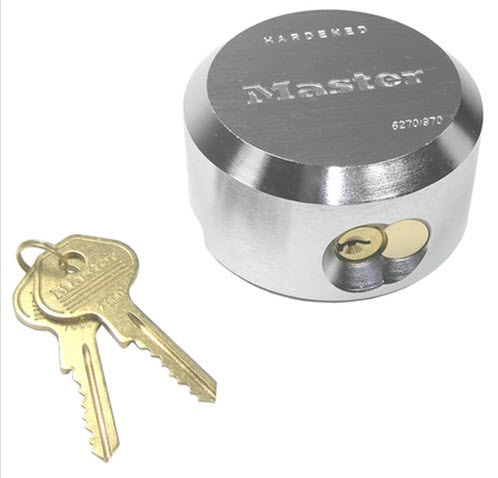 We believe that the addition of the above improvements to the guard would likely make the difference between a guard that can be defeated by cutting the lock shackle with a portable grinder in under 5 minutes or by prying off the house in less than 30 minutes to a guard that is more trouble than most installers will tackle. While John has agreed to consider making such changes, he has made no commitment to do so as yet. Unless or until he does so, we cannot continue to recommend his guard. 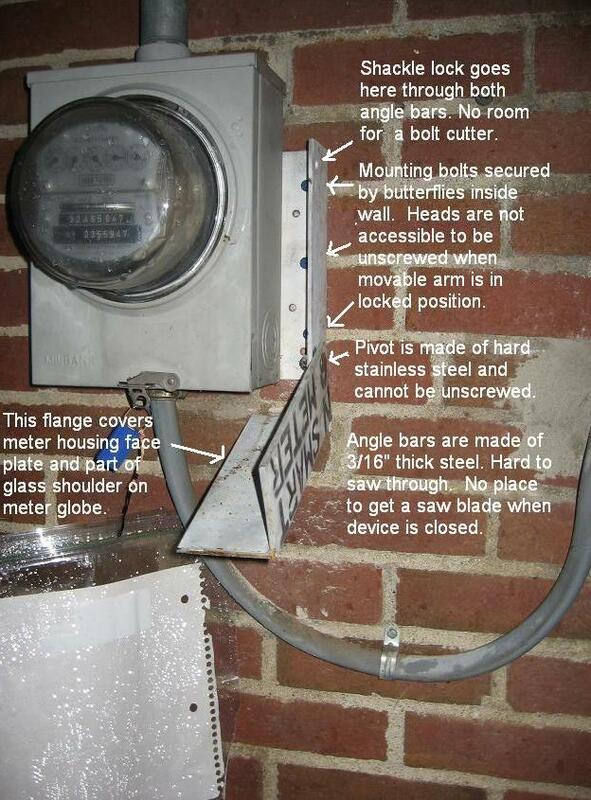 In the meanwhile those of you wanting to protect your meters may have to consider the more expensive custom made guard cage offered by acstolen in Florida, make one yourself, or have a metal shop make one for you. It’s still a good investment until you have someone on your porch telling you that they’ll cut your power at the pole if you don’t conform. In my book, that’s A dictatorship! DTE is constantly making those threats. They have almost never carried them out. They try to get everyone to cave in with threats like that. Thousands of people have locked meters, many since 2011. I just got notice they will be installing a smart meter. We received notice from Consumers Energy that they will be installing smart meters. We can opt out, but they will charge us $69+ upfront to keep our current meter, plus nearly $10/mo. after that — in effect, it is a penalty to keep things as they are. Is that legal?? BJ, We think that it is NOT legal but we must get a court to agree with us. We have several court cases pending. In the meanwhile they are getting away with these charges because the Michigan Public Service Commission has given them permission. The legality of Consumers opt-out plan will be coming up for review in the Michigan Court of Appeals the first week of April. We will know more after that. We are also working to get a law passed by the Michigan legislature that will uphold the rights of utility customers. We have already invEsTED $185.00 for a tater guard that’s about all we will invest I’m beginning to think maybe someone is out to make money on this. Who do you trust these days? Is anyone receiving letters from DTE claiming that under Michigan Public Service Commission (MPSC) Rule 460.137 a utility may shut off or terminate service? Just saw on Channel 7 last night (March 18th) where DTE cut off power to a house in Ann Arbor who had a lock on their meter. They did not turn it back on until they removed it. Did anyone else see this? Tom, I suspect we have not heard the last of this story. DTE violated its own tariff and MPSC regulations by turning off power without the legally required 10 day notice. This would seem to be, not an example of how DTE can afford to treat the 1000 or more people who have guards on their meters, but rather a scare tactic designed to cow the public. Don’t fall for it!